So I am in love with the drama series based on this show, and when I learned of the anime I immediately rushed over to continue enjoying the sweetheart who loves pairing food and drink. Disappointment. Watch the drama. 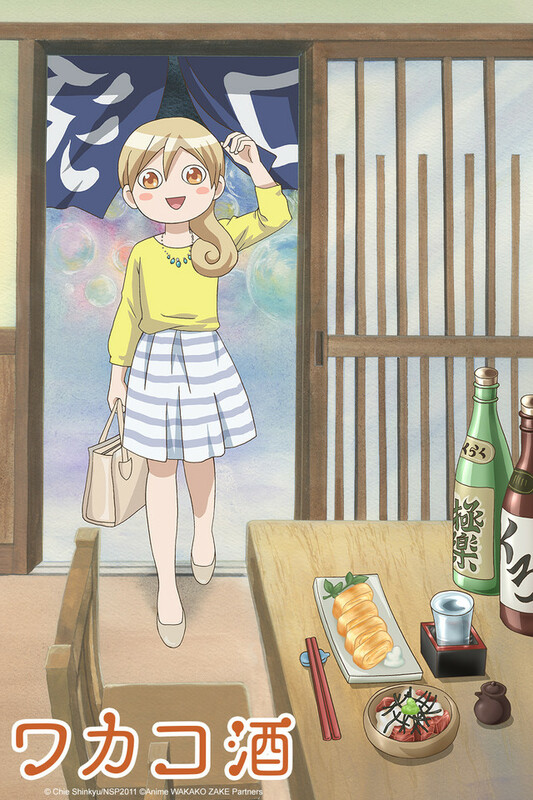 Wakakozake is the tale of the 26 year old office worker Wakako who loves food and drink, so after work she goes out to find a new delicious pairing. The animation is simple but sweet, and the backgrounds/food is well done, but if you're looking for Madhouse or Ghibli go elsewhere. for a 2 minute short about a woman eating food, it's perfect. We only really meet one character in the anime and that's Wakako herself. She really isn't fleshed out [but the series is under 30 minutes so what can you expect?] however, she's not as likeable as the drama. Compare episode one of the drama to episode one of the anime and Wakako anime comes off as rude, stuck up, and a little mean. Heck, compare the whole anime to just the first episode in the drama and you still have two different characters. Perhaps this is just a taste difference, do you prefer sweet or salty? The anime is fine if you have some time to kill, but it could fair much better if Wakako was more blissful about the food and atmosphere than complaining about work or how others prefer their food. Short but sweet; the perfect treat! A quick show that you can binge-watch in a sitting or just catch an episode while waiting for the kettle to boil, or your rice to cook. It's very simple and light-hearted, following the incredibly relatable joy of a delicious meal at the end of a long day. It's not especially fancy, but the love for good food is infectious and each episode never fails to put a smile on my face. Its a nice concise guide to japanese food and drink allowing you a look into the culture of enjoying food and the making of it. very short but is good for when you don't have time to commit to a massive anime watching spree or similar. Overall it left me wanting more of the same as it is nice background watching and very relaxing. Below Average and Poor Quality. This anime just didn't meet my standards which i admit are quite high, but even so this should be better. The food didn't have much detail on, the settings were always the same and for someone like me who doesn't care for alcohol this was boring. Therefore i give this 4/10.